The database helps facilitate responsible inland aquatic resource management. ArcView is used to display and analyze archival data. 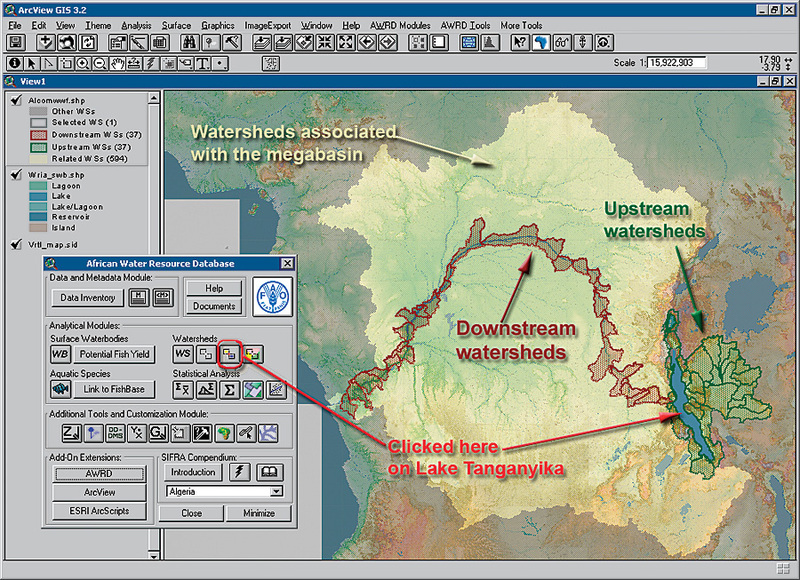 The GIS database allows integration of different types of information into a cohesive program. 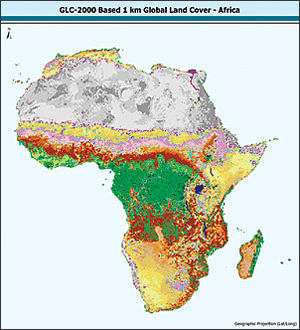 The Food and Agriculture Organization (FAO) of the United Nations used GIS to create a new tool for helping Africa cope with hunger and malnutrition. The African Water Resource Database (AWRD) includes an extensive archive and GIS tools designed to facilitate responsible inland aquatic resource management with an overarching goal of food security. 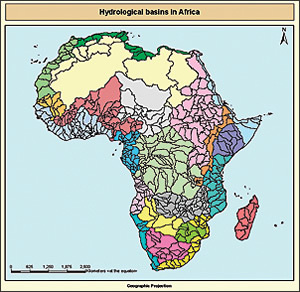 African Water Resources Database watershed visualization and analysis tools. Information stored in the data archive includes surface water bodies, watersheds, aquatic species, rivers, political boundaries, population density, soils, satellite imagery, and physiographic and climatological data. AWRD was designed for use by administrators, technical professionals, spatial analysts, teachers, and students. To display and analyze the archival data, AWRD contains custom applications and tools programmed to run under ArcView. The database allows integration of different types of information into a cohesive program that, because of its visual nature, is easy to understand and interpret. "Given the need to improve food security and economic growth in the African region and the widely recognized yet untapped potential for fish farming there, we have placed high priority on aquaculture as an investment in Africa," says John Moelh, regional aquaculture officer with FAO's Africa office in Accra, Ghana. 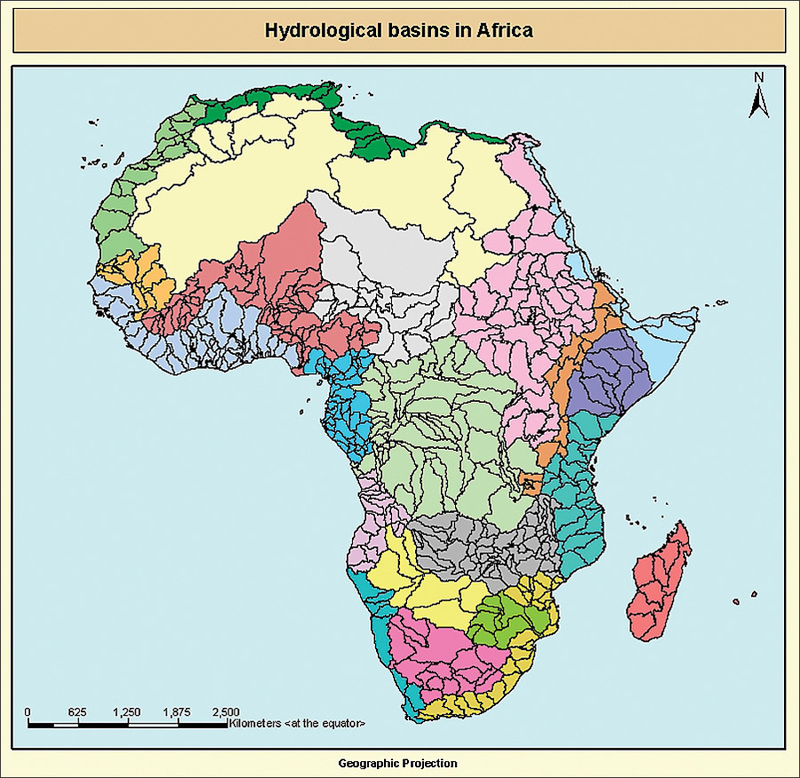 African Water Resource Database data archive. 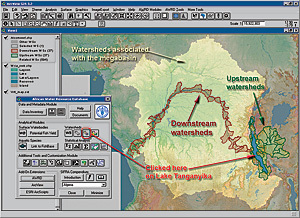 AWRD was designed based on recommendations from the Committee on Inland Fisheries and Aquaculture for Africa and is both an expansion and an update of an earlier project led by the Aquatic Resource Management for Local Community Development Program, called the Southern African Development Community Water Resource Database. "Aquaculture is one of the fastest food production sectors in the world," says Jos� Aguilar-Manjarrez, fishery resource officer, Food and Agriculture Organization of the United Nations. "We plan to use the AWRD this year to support sustainable development of fisheries and inland aquaculture in the Republic of Cameroon and in Mauritania." The database publication is presented in two parts: concepts and application case studies, and a technical manual and workbook. The primary AWRD interface, toolsets, and data integral to the function of AWRD are distributed in two DVDs accompanying the technical manual and workbook. The information is available for download through the GeoNetwork or GISFish portals. For more information, contact Jos� Aguilar-Manjarrez, fishery resource officer, Food and Agriculture Organization of the United Nations (e-mail: jose.aguilarmanjarrez@fao.org), or visit GISFish online at www.fao.org/fi/gisfish or the GeoNetwork at www.fao.org/geonetwork/srv/en/main.home.